The previous duvet cover, being sewn onto a foundation, didn't need any quilting. When I finsihed the serendipity quilt, I put it away in my UFO pile, fully intending on quilting it myself. That was *before* I found out what a royal PITA working with Warm and Natural is. 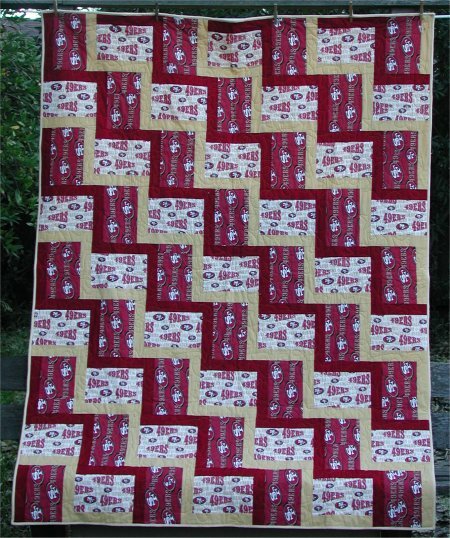 To be sure, Warm and Natural is a wonderful bat in a quilt ... but doing machine quilting with it on my home machine was a painful experience because it is such an unwieldy batting. For me, it was like wrestling a tree trunk through my machine. So, the serendipity top languished with other UFOs. Until the day, several months later, that I finally decided that I really *did not* want to machine quilt using the Warm and Natural, of which I had already bought an entire roll! So, I made the decision .. bit the bullet .. and took the roll of Warm and Natural plus 3 quilt tops over to my favorite local long-arm quilter [Janna Bailey of The Quilting Company] and had her professionally quilt it for me. 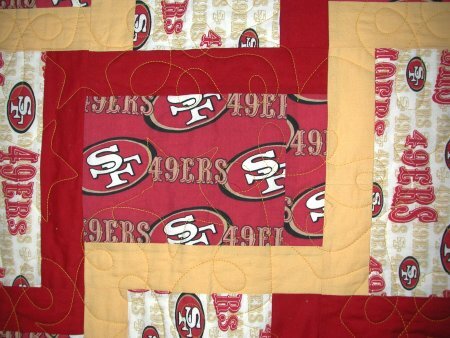 We decided that since the 49ers were 'stars' (smile), the over-all quilting motif would be stars integrated connected by a series of loops, in a heavy yellow quilting thread.